Anyone thinking of adding quartz or granite counter-tops to their home should consider the differences and details. Consideration must be given to you own personal tastes and needs, as well as exactly how these two materials hold up. There are both pros and cons for each material. This article will attempt to shine the light on quartz and granite in a way that assists homeowners in making the right choice. The first major difference we need to discuss is the fact that granite is mined. It is a natural creation of nature with 100% natural stone. What that means is that no two slabs are exactly alike. Some people like this and others don’t. Quartz counter-tops may look very natural but are actually manufactured. Quartz is crushed and then mixed in with a binding agent like resin. The patterns and colors you see are purely artificial. Naturally the quartz is real, however, the rest of the counter-top is of human design. Granite is mined and comes out in big natural chunks. That means the slabs are all imperfect even though they are beautiful to look at. It can be difficult to match up the consistency of the patterns to a kitchen decor, but some believe it’s well worth trying. It is mostly popular with people who desire to have something unique. Many people are under the impression that granite is unbreakable. This is a misconception. It is indeed very strong but will chip fairly easy from dropped pans or prolonged use. Still, they can last for up to 50 years without suffering a scratch. Maintenance is key when you have granite counter-tops. Another important point is if you use granite for creating a small, square-shaped counter-top, then it could be done with one piece. 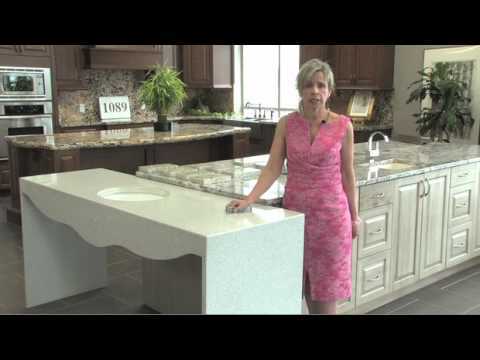 However, if you’re creating a longer counter-top you may need several pieces joined together. The problem with having several pieces is that the seams are next to impossible to hide. The best way to maintain a granite counter-top is to seal them regularly (1 to 3 years depending on amount of use). Sealants help to keep the granite from staining and collecting liquids (it is very porous and not naturally a stain-resistant material). The heavier the use the more often it should be sealed. One of the things people like the most about quartz is that it’s stainless and requires no sealing. When you have a quartz counter-top you have zero maintenance. That is a huge selling point for a lot of families, especially when they have children. While quartz is ‘stainless’ it will still discolor if left exposed to sunlight for too long. Placing them in front of windows could prove to be a costly move. Quartz can hold its own against granite in the strength department, especially in terms of chipping. Quartz is considered a bit stronger due to its flexibility. Under severe strain granite would be more likely to crack than quartz. As far as weight is concerned, quartz is heavier than granite. Both materials should be installed by professionals. When it comes to the seams that are nearly impossible to hide with granite, if you use a darker shade of quartz you can get a very sleek and clean seam that hardly shows. Granite: This material gives you a broader variety of prices. The cheapest and lowest grade can be installed for around $30 a square foot. If you choose to go high-end and get something exotic and rare, it can cost you around $150 a square foot. The average costs are around $60 a square foot. Quartz: This material has always cost more than granite, however, with new technology making its way into how we do everything, things are not so far apart as they used to be. You can find quartz running you from $65 to $100 a square foot. Most of the information listed above reveals that quartz seems to be leading in most categories. It is non-porous which means spilling wine or other very staining agents onto it has no effect. It wipes right up. The maintenance is practically non-existent. It cleans up with soap and water. Quartz is also made to be hygienic. It makes it harder for bacteria to grow than granite does. In families with children being able to prepare food on your counter-tops is a really key point. Still, even with all the points made in this article, this debate between quartz and granite has been going on seemingly forever. It comes down to a matter of personal taste and how it will be used. You need to make a choice based on your lifestyle, home design, and personal preference. Whether you are remodeling a kitchen or a bathroom, the ‘best’ choice all boils down to you. The best thing to do is to read articles like this one and some reviews and come to the best conclusion for your personal project. Either material can work well when installed properly and can add an elegant look to any kitchen or bathroom remodeling project.